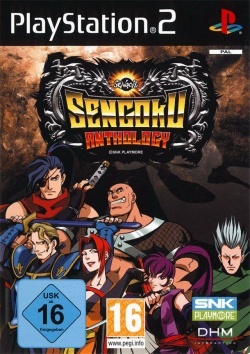 Game description: Sengoku Anthology is a collection of the three games from SNK's Sengoku arcade franchise including Sengoku (1991), Sengoku 2 (1993), and Sengoku 3 (2001). In addition to being able to play the classic arcade games on PS2, players can unlock artwork by completing each of the games in the collection. The Sengoku titles are classic scrolling beat'em up action games. Up to two players can play simultaneously. One of the features of these games is the ability to pick up power-ups to obtain new weapons or transform your character into special characters. In Sengoku 3, players choose different characters with unique weapons and special attacks at the beginning of each level. This page was last edited on 14 December 2015, at 20:32.